« That coat of arms gets everywhere, part 379! 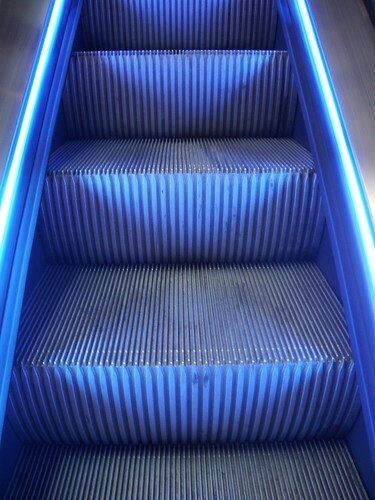 Here’s a detail from the up escalators at the Lighthouse (Glasgow’s centre for design and architecture). This entry was posted on June 22, 2009 at 12:01 am	and is filed under Uncategorized. Tagged: blue, escalator, Glasgow, Lighthouse. You can follow any responses to this entry through the RSS 2.0 feed. Both comments and pings are currently closed. This one’s a real stunner. I like the illuminated colors!! Awesome! It’s amazing how something as plain as an escalator can be so photogenic! Absolutely love the Lighthouse – the 360 degree view from the top is outstanding, even on a usual Glasgow day of weather! Fantastic!!! Love the color! Woohooo!!!! Funny thing about escalators. As I am going up on them, I am absolutely fine. No problem. However, when I step off, I am suddenly so dizzy, it takes a few seconds to gather my bearings. Weird, huh? And, never, ever happens in an elevator. Why do the hand rests go at a different speed to the actual stairs? How do we know it’s not a down escalator and you’re not messing with our minds Jackie? Nice shot. I once spent several minutes trying to shoot the escalators in the Seattle Central Library. The results turned out to be unspectacular. Love it! The color esp.